This condo community is located on the south side of the Gainey development, within an easy walk to the Shops at Gainey Village and the Gainey Ranch Golf Club. 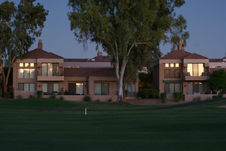 Many units enjoy beautiful views of the Lakes Golf Course. Sizes range from 1650 to 1776 square feet. HOA fees are $497 per month and prices start around $450,000.